Low power (under-voltage) will certainly damage any refrigeration appliance’s compressor. The FridgeGuard protects your appliance by disconnecting the power when it goes below unacceptable level. Additionally, there is a delay when power returns to normal. This will ensure that the appliance is not switched on-off repeatedly during fluctuations nor is it subjected to a massive surge normally experienced when power returns after power cuts. The FRIDGEGUARD will disconnect the power to your appliance if the mains voltage drops below or above a pre-set limit. The FRIDGEGUARD will re-connect automatically only after the supply has returned to acceptable limits after a 3 minute wait time. The TimeSave™ function will ensure the FRIDGEGUARD provides maximum operation time to your appliance by having built-in intelligence to check the off time. 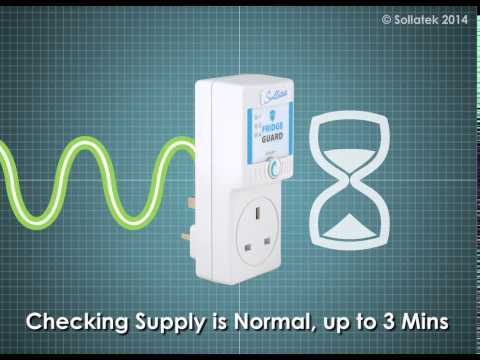 If the unit has been off for more than 3 minutes, it will reconnect the mains within 10 seconds rather than the standard 3 minutes. The iSense™ technology allows you to control how sensitive the FRIDGEGUARD is to voltage problems. Using the iSense™ dial you can set the desired level of protection. Low setting ensures more working time, it will tolerate wider acceptable voltage limits. This is ideal for users with more erratic mains supply. This setting provides a wider window of acceptable voltage limits. High setting ensures greater protection, by narrowing the acceptable voltage limits. This is ideal for users with less erratic mains supply that require better protection, typically in main cities where the power supply is fairly stable.